Piso Fare Promos 2019 - 2020 is here! And this will be updated with all Cebu Pacific, Philippine Airlines, Air Asia promos, Piso Pair, and Piso Sale. Piso Fare 2015 Promo: Here's the latest Cebu Pacific Piso Fare Promo for 2015 travel dates (see below). Join the CebCLUB and get more exclusive sale if you're a member! Just visit their website. You can only avail this Piso Fare Promo if you have a Ceb Club account. Aviation Security Fee for flights exiting from/transiting in Cebu. Quoted DOMESTIC one way fare is inclusive of PHP1 Base Fare, Php 120 Web Admin Fee, 12% VAT, Php 200 Terminal Fee for flights transiting in or exiting from Manila/Cebu Station and 7 kg hand-carry baggage allowance, but exclusive of Fuel Surcharge ranging from Php 200 – Php 550 and check–in baggage. Terminal Fees ranging from Php 50 – Php 200 for flights originating from non-Manila/non-Cebu Stations must be paid at the airport. Quoted INTERNATIONAL one way fare is inclusive of PHP1 Base Fare, Php 120 Web Admin Fee, and 7 kg hand-carry baggage allowance but exclusive of Php 550 International Terminal Fee, Php 1,620 Philippine Travel Tax, Fuel Surcharge ranging from Php 675 – Php 5,400, Country-Specific Taxes ranging from Php 420 – Php 1,315 and check-in baggage. Promo fares have limited availability and are non-refundable but rebookable subject to the following rebooking fees: Php 1,200 for Domestic destinations, Php 2,000 for Short-haul destinations and Php 2,500 for Long-haul destinations plus fare difference. For your convenience, flight changes, availing of prepaid baggage allowance for check-in baggage and web check-in service can be done up to 4 hours before your scheduled flight. AVAILABLE NUMBER OF SEATS ON SALE PER ROUTE and v.v. DOMESTIC: MANILA TO: Bacolod: 3,940; Busuanga: 820; Butuan: 2,030; Cagayan de Oro: 3,980; Caticlan: 1,690; Cauayan: 340; Cebu: 9,430; Cotabato: 850; Davao: 6,620; Dipolog: 620;Dumaguete: 1,180; General Santos: 2,030; Iloilo: 5,120; Kalibo: 4,520; Laoag: 280; Legazpi: 2,310; Naga: 5470; Ozamiz: 680; Pagadian: 760; Puerto Princesa: 2,210;Roxas: 680; San Jose: 260; Tacloban: 2,030; Tagbilaran: 590; Tuguegarao: 770; Virac: 250; Zamboanga: 1,990. CAGAYAN DE ORO TO: Bacolod: 120. CEBU TO:Bacolod: 950; Busuanga: 60; Butuan: 870; Cagayan de Oro: 1,540; Camiguin: 280; Caticlan: 780; Clark: 260; Davao: 2,340; Dipolog: 280; Dumaguete: 280;General Santos: 590; Iloilo: 870; Kalibo: 4,020; Legazpi: 160; Ozamiz: 280; Pagadian: 280; Puerto Princesa: 680; Siargao: 280; Surigao: 550; Tacloban: 870; Tandag:120; Zamboanga: 590. DAVAO TO: Bacolod: 300; Cagayan de Oro: 270; Iloilo: 640; Zamboanga: 670. ILOILO TO: Cagayan de Oro: 180; General Santos: 260;Puerto Princesa: 250. ZAMBOANGA TO: Tawi-Tawi: 590 and v.v. INTERNATIONAL: MANILA TO: Bali: 200; Bangkok: 1,170; Beijing: 390; Brunei: 490; Busan: 390; Dubai: 1,650; Guangzhou: 390; Hanoi: 260; Ho Chi Minh: 680; Hong Kong: 2,710; Incheon: 1,650; Jakarta: 390; Kota Kinabalu: 290; Kuala Lumpur: 1,360; Kuwait: 710; Macau: 680; Nagoya: 400; Osaka: 500; Phuket: 200; Shanghai: 680; Siem Reap: 400; Singapore: 2,620; Taipei: 680; Tokyo: 680; Xiamen: 200. CEBU TO: Busan: 400;Hong Kong: 680; Incheon: 680; Singapore: 680. CLARK TO: Hong Kong: 590; Macau: 340; Singapore: 230. ILOILO TO: Hong Kong: 260; Singapore: 260 and v.v. 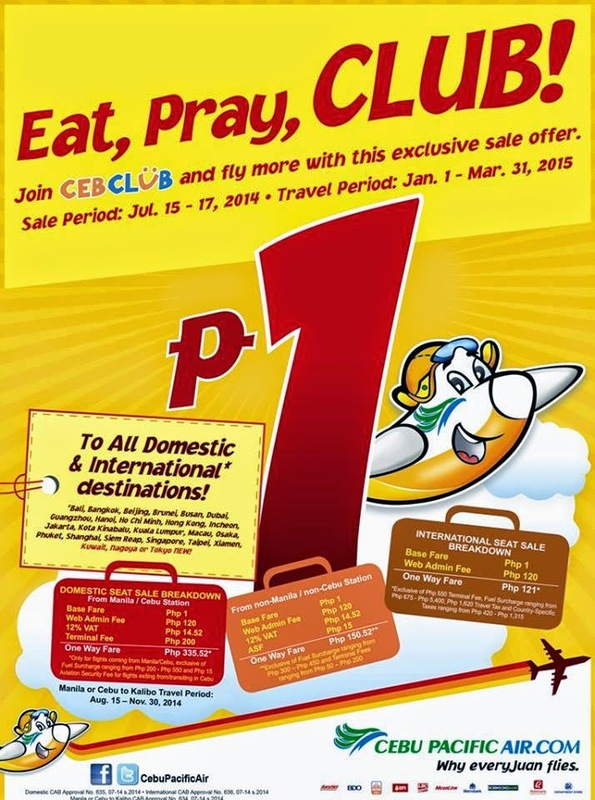 Piso Fare 2015 Promo from Cebu Pacific Air! Copyright 2017. Pisofare.org. Simple theme. Powered by Blogger.